Last month as I finished my book Stories from the World War II Battlefield Volume 3: Writing the Stories of War, I wrote an article about the Trauma of War. Not only was I finishing the book but also reading Gated Grief by Leila Levinson. Gated Grief is about Leila’s search for her father’s World War II story as a medic who took care of the prisoners in Nordhausen. Throughout the book, Leila describes her journey of discovering her father’s war photos, unraveling her memories of him and her life, attempting to discover WHO her father was and how the war affected him, and finally, how the war affected her life and how she raised her own children. What pulled me toward the book was the process Leila went through and how she handled all the information she learned. How she healed herself and her family. In my Trauma of War article series, I hope to document some of my journey of healing both my past and the past of others who lived through or died in the war. We are all connected through consciousness and when we heal ourselves, it ripples out into the universe and heals others, whether they are aware of it happening or not. I also hope to provide questions for my readers to consider as they research and write their stories of war – for ANY war. Leila provided some interesting quotations in her book that are worth considering. What cannot be talked about cannot be put to rest. And if it is not, the wounds will fester from generation to generation. – Bruno Bettelheim, Surviving and Other Essays. What do you think of that quote? I believe it, as I’ve encountered things not talked about regarding my grandfather’s service, fester and change through the generations. This is something I’m still working through as I think about pieces of his story and that of my grandmother’s. In another sense, the wounds fester from generation to generation but also from past lives to present lives. Have you ever thought about the issues you face today and where they really came from? Leila provided another great quote from Susan Sontag from Regarding the Pain of Others a book I have on my “must-read” list. Have you read this book? I’d love to hear your thoughts. Harrowing photographs do not inevitably lose their power to shock. But they are not much help in the task to understand. Narratives can make us understand. Photographs do something else: they haunt us. With this quote, Leila begins the chapter about finding her father’s photos from the war and having no context as to what they are, how they affected him, did he take them or did he save them for someone else…… When I read this quote, I felt it is not just harrowing photographs that can haunt us but even somewhat “harmless” photos like the one of my grandfather in this post. He looks lost. It makes one wonder, what happened to him? 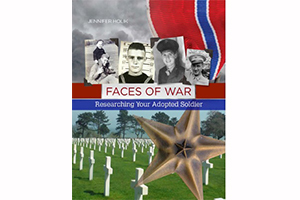 As you research your stories of war, regardless of which war – World War II, Korea, Vietnam, Iraq, or any other war or conflict in which a family member participated, dig deeper than the basic facts. Ask the hard questions not only to yourself but others. Write the narrative to accompany the stories you’ve heard, research you’ve uncovered, and photographs you have. No story is ever finished, but as we research, write, and take some space to just BE with the information, we can heal a lot within ourselves and our families. I’d love to hear from you if you have been thinking about these ideas or similar ideas. How have you journeyed through your family’s war past? How have you handled it? 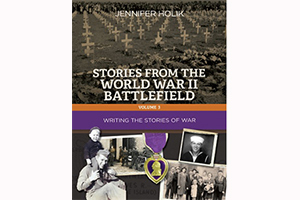 I am finishing the writing for Volume 3 of my Stories from the World War II Battlefield series on writing the stories of war. This book will be released in two versions in May, and contains over 500 writing prompts to help you write the stories of war, from a U.S. or European perspective. When I was creating the writing prompts, I spent an entire day thinking, writing, and crying, over a subject I was not sure if I should include. The trauma of war. 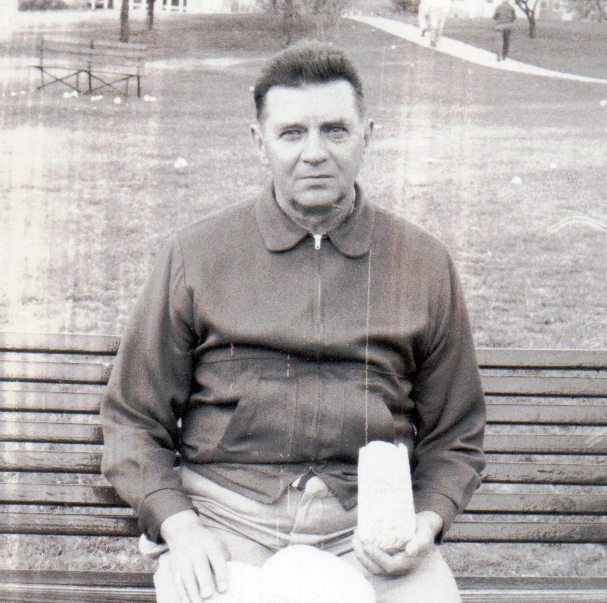 Today I am thinking about my grandfather, who was born this day, 17 March 1906 in Chicago. My grandfather, Joseph Holik, served in the US Naval Armed Guard for almost two years, 1943 – 1945. In July 1945, he was removed from his ship and sent to a Naval Hospital in California for treatment. His mind was not what it should have been and Grandpa Joe ended up living the rest of his life in the VA Hospital. My grandmother essentially became a single mother when he went to war, with three boys under 12 at home. When I started researching and writing the stories of my family, this is one story I was not ready to touch. The last few years, being a single mother myself, really brought the story closer and I could see similarities between me and my grandmother. My grandfather’s story has been too painful for me to really get close to until this year. I never knew my grandfather. I only heard whispered stories about his service and his life. Each story was different and even my grandma didn’t tell me much while she was alive and I was asking questions. Have you every stopped to consider the words we speak, and those we do not, affect us, our families, descendants, and everyone else they might touch? Have you ever thought how the trauma of war filters down through the generations and affects those of us who were not even alive during the war? For now, I encourage you to think about the questions I posed in this article. Feel free to share how your family spoke of, or did not, the war and the effects on the soldier and family.